With her exquisite curves and exotic features, Moon Shadow Villa was designed to take your breath away. View her from afar and notice her sleek and unique design. View her from up-close and notice the fine quality and details to be found in every corner. Or spin it around and enjoy her uninterrupted views of the Gulf of Thailand from the sundeck and her three private terraces. Sporty types will get a thrill of the direct view of the nearby golf club, just three-minutes’ drive from the villa, while everyone and everyone can enjoy the stunning views of the crystal waters and large boulders as they look over the famous Coral Cove. For a fresh perspective, take a stroll through her carefully-manicured tropical garden. Yes, thanks to famed architect Bodin Sritrakul’s meticulous design, Moon Shadow Villa is a treat for the eyes as well as the soul. 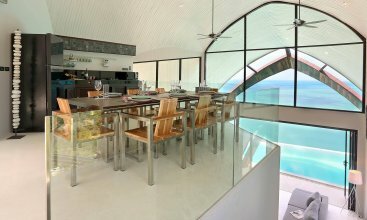 Guests at Moon Shadow Villa will enjoy every detail being taken care of for them, from when they are whisked from the airport to their luxury accommodation by private chauffeur, to when they breeze through the entrance to discover an interior just begging to be the setting of your holiday dream. Within her beautifully-constructed walls, guests will find a private haven with a soothing colour palette that weaves its way throughout all four bedrooms, alongside their floor-to-ceiling windows, snaking in and out of the elaborate closets, all the way to the split-level indoor entertaining area, and beyond to the expansive outdoor living space, where the inviting infinity pool beckons as le piece de resistance. 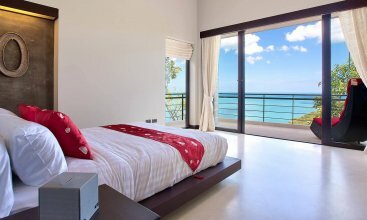 And though Koh Samui is an extremely safe island, guests can be reassured by CCTV and security cameras hidden in discreet corners, and in-villa safes in each room to protect their valuables. A stay at this paradisiacal villa means guests will want for nothing, and with all their needs taken care of, there is nothing to do but simply…enjoy life. 24/7: English, Chinese, French, speaking personal Guest manager including Concierge Service offering discounted bookings of boat tours, excursions, car/bike rental etc. For you’re your fully satisfaction and holiday happiness, Moon Shadow Villa is offering you fully complimentary and carefully selected staff for daily housekepping and an English speaking guest-relation manager on-site. Moon Shadow Villa has been designed for the ultimate in luxury holidays. 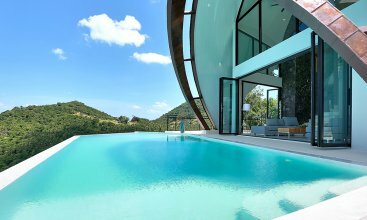 With countless awards for both design as well as functionality including winner of the prestigious Thailand’s Best Property Award 2013 for Best Villa Architectural Design. Architect and designer of Moon Shadow Bodin Sritrakul is well-known for creating buildings which blend seamlessly into the environment in which they reside. 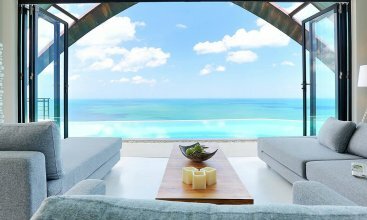 Most recently Moon Shadow won Best Honeymoon Hideaway 2015 in the World Boutique Hotel Awards 2015 in London, making Moon Shadow one of the most sought-after villas in Koh Samui. The villa comprises of 3 pavilions which allows for the privacy and space you seek on any vacation. Boasting 4 bedrooms, 3 of which have their with own private terraces affording guests 180 degree sea views, each bedroom has floor to ceiling windows, luxury closets, flat screen TVs and is immaculately furnished with a natural and soothing colour palette and adorned with Thai touches for a truly authentic feel. 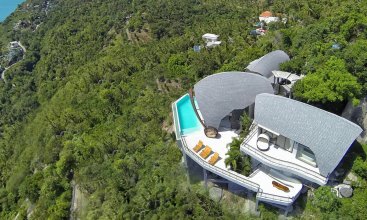 With expansive outdoor living areas, split level indoor entertaining areas, all the modern facilities you could want for in a home away from home and of course an incredible infinity swimming pool allowing you to enjoy the ideal weather Koh Samui has to offer. The services are endless at Moon Shadow including Private Chauffeur -Airport pick up and return, Daily breakfast (Continental, American, English, Thai, Chinese, Indian), complimentary drinking water, discretional 5 Star in–house villa service with 2 staff (including Private Chef), in-villa dining menu, pre-arrival food shopping, bathroom amenities, hairdryer, bathrobes ,XXL Pool Towels, a local SIM Card with starter balance and 24 hour Villa Manager to help with all your needs during your stay. For your peace of mind, CCTV and security cameras are fitted along with personal safes for each bedroom.